Formicary or “ants’ nest” corrosion on the outside of air conditioning coils is not new, but it is becoming such a problem that members of one Ontario contractor group have decided that they will only install equipment with aluminum evaporator coils. “We’ve had to replace new equipment coils in year one, two and three,” added Nancy McKeraghan of Canco ClimateCare, Newmarket, Ont. 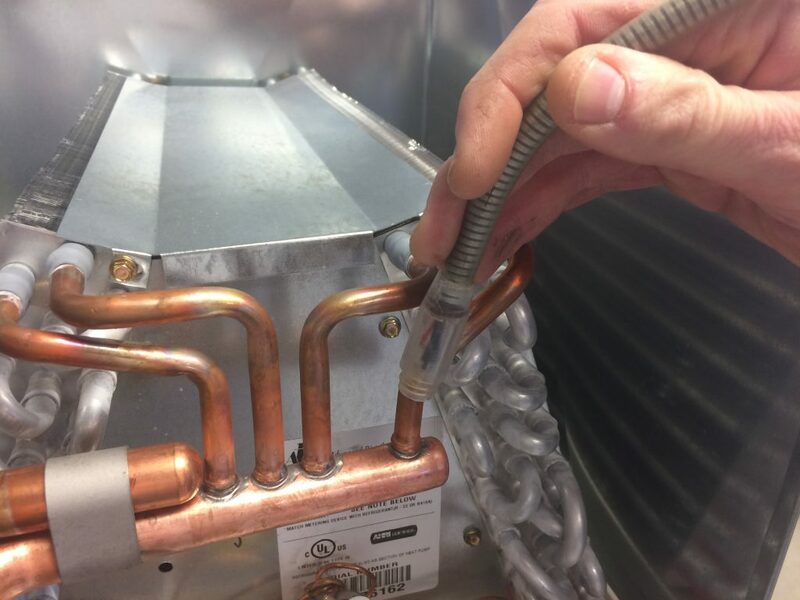 Last fall the ClimateCare Co-operative, a group of 34 independent Ontario HVAC contractors headquartered in Burlington, Ont., decided to go aluminum only for evaporator coils in their private label air conditioning equipment. With parts and labour warranties up to 12 years, they will simply not sell equipment with copper coils. “That way we can eliminate the corrosion,” said Murtland. It’s important to note that the issue doesn’t affect the equipment of only one manufacturer; most, if not all, of the majors have been affected. 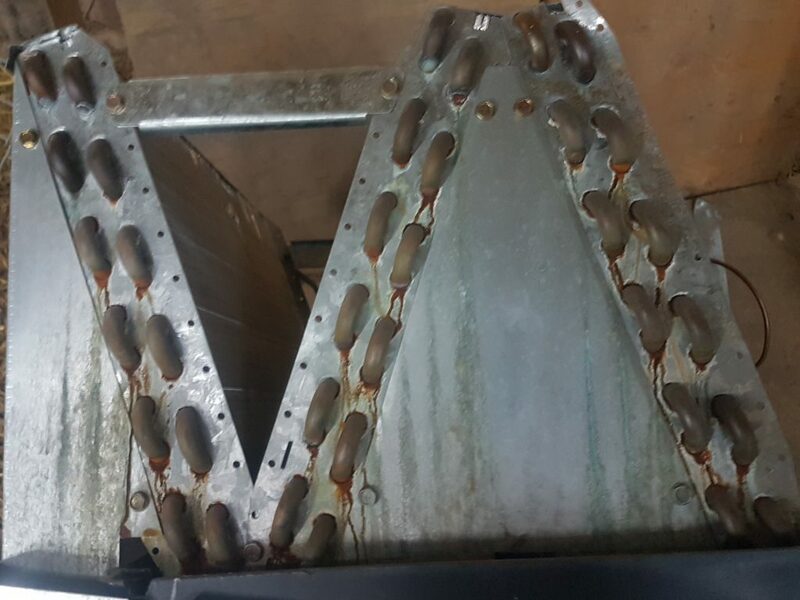 A multitude of factors have come together to make failing evaporator coils a significant problem in the past three years, reported Glenn Mellors, ClimateCare director of training and implementation. These include indoor air quality and tighter homes. Volatile organic compounds (VOCs) that gas off from carpets, building materials, furniture, etc. combine with oxygen and moisture to create an acidic solution that reacts with the copper to cause pinhole leaks. “The homes are tighter and there are not enough air exchanges. It slowly eats away at the coil,” said Murtland. The problem is worse in areas with poor outdoor air quality – pollution, added Mellors. Cases of formicary corrosion are higher in industrialized southern Ontario than in the Ottawa Valley, for example. In some cases, manufacturers have modified the copper coils to improve efficiency, using thinner wall and/or rifled copper tubing to maximize heat transfer. “It all has to do with, in my mind, the striving for higher efficiencies,” said Mellors. This aluminum coil offers a solution to formicary corrosion. Formicary corrosion can easily be identified if it is on the outside of a coil. It appears as a dark stained “soil” buildup around the leak. When the corrosion is internal, it’s a different matter. Often, when a technician diagnoses an air conditioner suffering from formicary corrosion, there are no visible signs, but the refrigerant level is low. “It’s almost like the refrigerant is leaking by osmosis,” said Mellors. The quick and dirty fix is to just “fill and go,” or perhaps add a leak sealant and then fill. That might get the coil through the warranty period, but it’s going to leave one very unhappy homeowner faced with a problem that can only get worse. It’s unprofessional and not something ClimateCare contractors would do, added Mellors. So, they replace the coil, typically losing money on every warranty repair. Contractors have been frustrated because manufacturers have been slow to acknowledge the problem, added Murtland. Or, as Mellor says, “they’ve been in denial” due, in part, one would expect, from a number of lawsuits in both Canada and the U.S. over formicary corrosion. That being said, some time ago Carrier released a report titled Indoor Coil Corrosion. The company also offered a solution in the form of tin-plated copper coils. Some other manufacturers adopted aluminum coils. However, the switch to aluminum has taken time because manufacturers had to have those coils certified as a match with their equipment so that the homeowner could qualify for energy efficiency rebates. It’s an expensive and time-consuming process. Getting each coil certified with each air conditioner costs thousands of dollars. Some manufacturers still don’t have a full line of aluminum coils, noted Murtland. The staining on this coil is a result of external formicary corrosion. Much of the anger has, not surprisingly, been directed at installing contractors. “We’re telling the homeowner that their new air conditioner will run for years,” said Murtland. Needless to say, when homeowners run into leaking evaporator coils within the first few years, they are not happy. “As an industry, we have to wake up and say we aren’t going to use a product that won’t last in newer homes,” says Murtland.